Choose which mailbox appears on Apple Watch. Open the Apple Watch app on iPhone, tap My Watch, then go to Mail > Include Mail. You can specify only one mailbox, but if you don’t choose a mailbox, you’ll see content from all inboxes. Delete email. 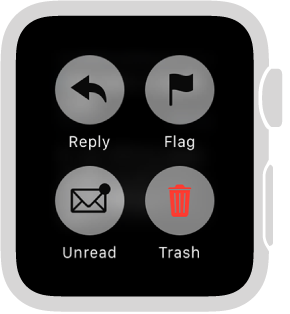 If you’re reading the message in Mail on Apple Watch, firmly press the display, then tap Trash. If you’re looking at the message list, swipe left on the message, then tap Trash. You can also delete a message from its notification—scroll to the bottom of the message, then tap Trash. Deleting a message on Apple Watch also deletes it from iPhone. Note: If your account is set to archive messages, you’ll see an Archive button instead of a Trash button. Flag a mail message. If you’re reading the message in Mail on Apple Watch, firmly press the display, then tap Flag. If you’re looking at the message list, swipe left on the message, then tap More. You can also flag the message when you preview it in a notification—swipe to the Flag button at the bottom of the message. You can unflag a message that’s already been flagged. Note: If you swipe left on a message thread, the action you choose (Flag, Mark as Unread, or Delete) applies to the entire thread. Change the flag style. Open the Apple Watch app on iPhone, tap My Watch, then go to Mail > Custom > Flag Style. Mark email as read or unread. If you’re reading a message in Mail on Apple Watch, firmly press the display, then tap Unread or Read. If you’re looking at the message list, swipe left on the message, then tap More. Customize alerts. 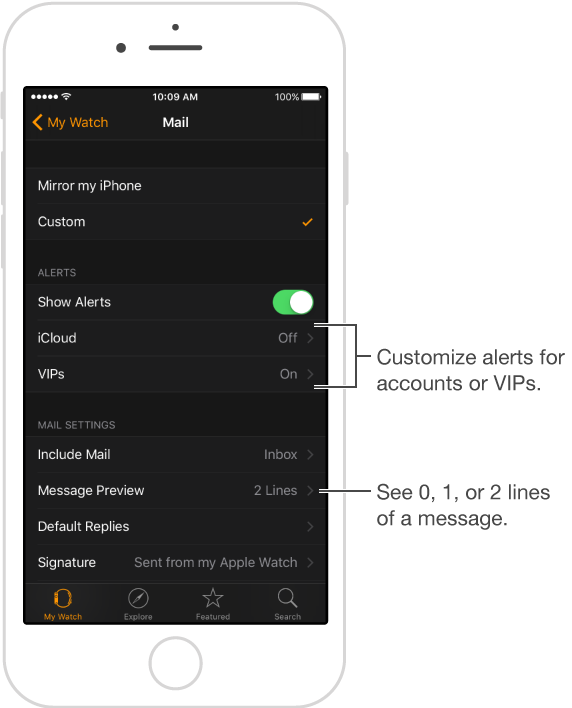 Open the Apple Watch app on iPhone, tap My Watch, then turn on Mail > Show Alerts. Tap each account or group, turn on the option to be alerted, then choose Sound or Haptic. Shorten your message list. To make your mail list more compact, reduce the number of preview text lines shown for each email in the list. Open the Apple Watch app on iPhone, tap My Watch, go to Mail > Message Preview, then choose to show only 1 line, or none.